It’s everywhere and there’s nothing we can do about it. You can find it down the streets, at your little sister’s birthday, at your graduation’s party and now even at your best friend’s wedding: it’s the selfie stick. Now, the selfie stick makes its may to the runway being the modern accessory used during the Reem Acra fall 2016 bridal collection presentation. Even though we are used to some fashion designers’ interpretations of the digital generation (just think about Dolce & Gabbana’s latest show, where the models had fun posting live-selfies while rocking the catwalk), a selfie stick at a wedding ceremony might still look a little weird to some of us. However, that’s not what Lebanese fashion designer Reem Acra thinks about this tech accessory. 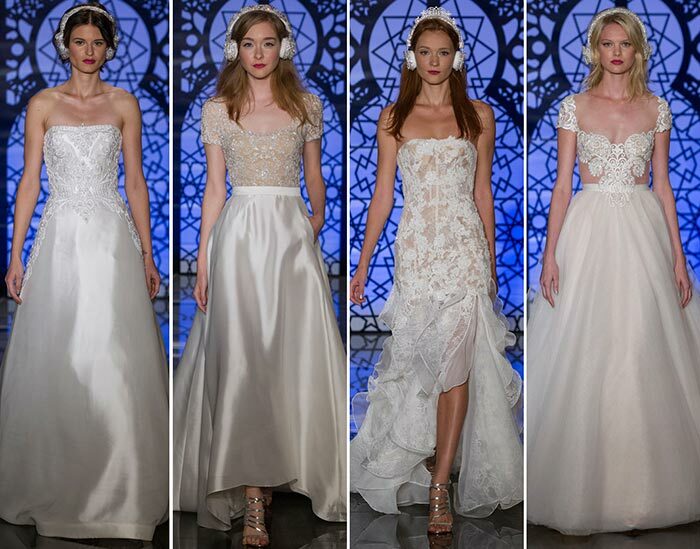 Known for her modern designs and captivating concepts, Reem Acra has recently unveiled her fall 2016 bridal collection, which features big spangly headphones and shining selfie sticks. Acra, who debuted her first bridal collection in 1997, is celebrated throughout the world for her ability to match any woman’s body with her inner personality, and has so far been dressing some of the most elegant celebrities and royalties for their ceremonies and red carpet events. 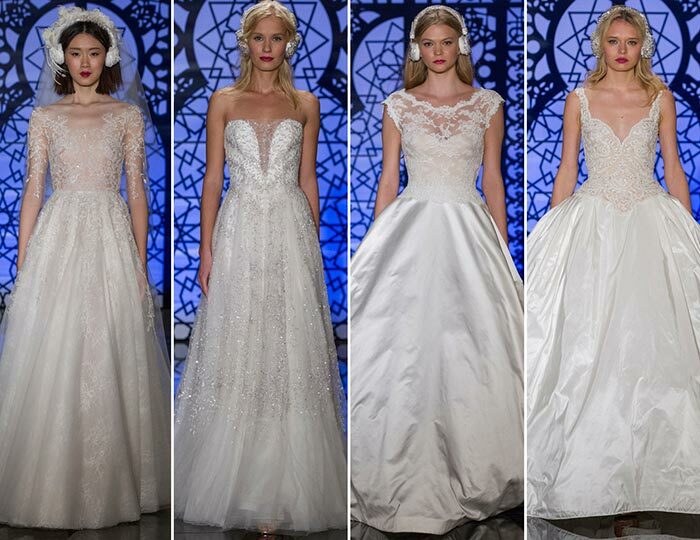 For her fall 2016 bridal collection she opted for extremely sensual designs, which sinuously hug each model’s silhouette. The dresses, which literally shine in their own lights, sparkle from head to toe due to cascades of crystals and sparkling embroideries used, resembling fairy constellations of starts. Acra’s well-known gowns, renowned for transforming traditional wedding dresses into modern masterpieces, find in this collection their time to shine, giving us a hint of the fashion designer’s impeccable craftsmanship and tailoring skills. Each gown is in fact different from one another, and Acra has enjoyed playing with different sizes, lengths, designs and volumes. There are mermaid gowns, as well as A-line and tight skirts, impeccably balanced with delicate sweetheart, plunging or V-necklines. Acra is well aware of the fact that brides come in all shapes and sizes, and wanted to give each woman the possibility to find the perfect dress in her latest collection. All the gowns were adorned with intricate designs, which at times remind of Art-Deco-inspired floral and geometrical patterns. 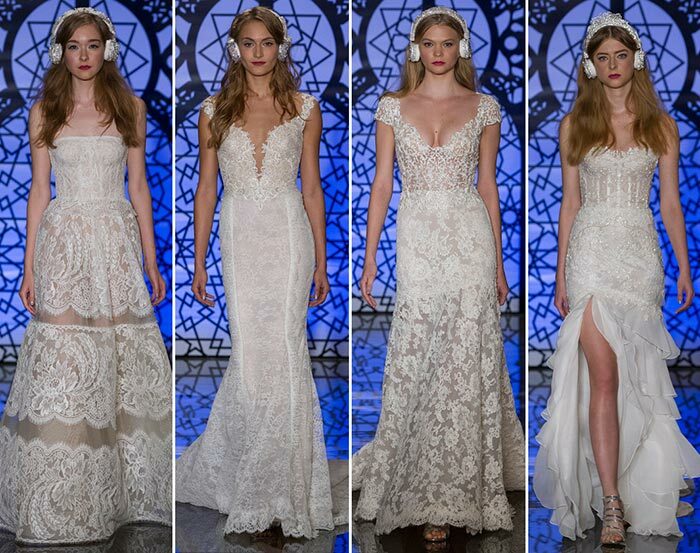 3D appliqués give as a taste of Acra’s interpretation of the main bridal trends for 2016, which include above all a great amount of lingerie-inspired lace and see-through fabrics. In this respect, she combined sheer fabrics with intricate embroideries, which reveal a lot about the brides’ body, yet in a subtle way. Thanks to the sophisticated and fairy-tale-like patterns, such fabrics look definitely more delicate than vulgar, and create the illusion of being tattooed onto the models’ bodies. While most of the designs were tight-fitting, Acra gave her collection a touch of diversity offering a few structured gowns, which gracefully embraced the layering concept. Moreover, deep front slits will give an ethereal fluidity and movement to the bridal dress, making sure the bride feels 100% self-confident in her own skin. 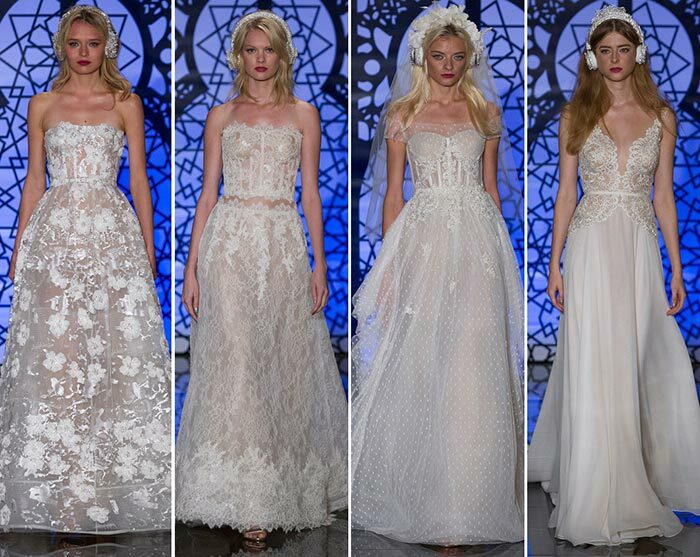 Last but not least, we may add that Reem Acra’s fall 2016 bridal line is the perfect combination between modernity and tradition, and we just have to wait and see if the wedding selfie-stick is going to make history or not.